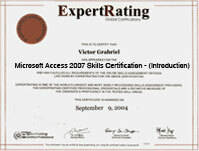 (leading to ExpertRating Microsoft Access 2007 Skills Certification - Introduction). Learn how Microsoft's powerful and award-winning database can help you manage, store, search, analyze, and display important information you've collected about your business, home, community, or any other entity. In this practical and project oriented hands-on workshop, you'll learn how to create tables filled with fields and records. You'll build relationships between the tables to eliminate redundancies and slash data entry time. You'll discover how to achieve huge reductions in data entry errors by setting default values, creating validation rules, and building input masks. You'll find out how to make your database more user-friendly with custom data entry forms, smart lists, and other sophisticated controls. You'll learn how to retrieve exactly what you need from your database with powerful queries and reports, and you'll even start automating routine tasks with labor-saving macros. Part II of this course is also available. Any of these courses can be bought collectively or individually for $129.99 each. This course includes a knowledgeable and caring instructor who will guide you through your lessons, facilitate discussions, and answer your questions. The instructor for this course will be Craig Power. About the ExpertRating Online Microsoft Access Course (2007) instructor : Craig Power has worked in adult continuing education for more than 18 years. A UCLA graduate, he created custom accounting software for state and local governments; developed an online course delivery and marketing platform currently used by more than 1,500 colleges and universities in the US, Canada, and Australia; developed an interactive cellular biology video for the Los Angeles Unified School District; taught college-level information technology courses; started and grew a thriving small business; and served as an executive with a large academic publishing corporation. ExpertRating Microsoft Access 2007 Skills Training Course requirements: For taking this instructor led ExpertRating Online Microsoft Access Course (2007) you need Microsoft Windows Vista or XP, Microsoft Access 2007 or Microsoft Office Professional 2007 (please be sure to install this software on your computer before the course begins), Internet access, e-mail, and the Microsoft Internet Explorer or Mozilla Firefox Web browser. Note: This course is not suitable for Macintosh users, nor for users of any of older versions of Microsoft Access. "I just wanted to let you know that I appreciate your having designed a course that was simple, clear, straightforward, and at the same time, comprehensive." "I needed to learn enough to use an existing database and the lessons were just in time as I am working through the project. The lessons were extremely detailed and this was exactly what I needed for a 67-year-old doing this kind of thing for the first time!" "I want to thank our instructor for his patience and polite responses to questions posed. Also, I very much appreciated the number of actual pictures provided which greatly help you to understand the text." "I've never taken an online course before and found this to be a very positive experience! Thank you!" "I thoroughly enjoyed the course. I tried learning Access 2007 on my own, and although I got quite far on my own, this course really showed me how little I really knew! Thank you so much. I can put the things I learned into practice immediately - actually, I already have!" ExpertRating is one of the world's only ISO 9001:2015 Certified companies (from TUV America) offering an Online Microsoft Access (2007) Course (leading to ExpertRating Microsoft Access (2007) Skills Certification). When you choose the ExpertRating Online Microsoft Access Course (2007) you can be sure that you are buying a premium International certification that is recognized by hundreds of employers and Government bodies in the US and other countries. With ExpertRating you get certified quickly online and you are equipped with a store house of information through the in-depth ExpertRating Online Microsoft Access Course (2007)ware which has been developed by experienced Computer Application Experts. The ExpertRating Microsoft Access 2007 Skills Certification is by far the best value for money instructor led Microsoft Access 2007 Program at $129.99. *Microsoft and Access are trademarks or registered trademarks of Microsoft Corporation. How much does the Microsoft Access 2007 Certification cost and what does it include? You can buy this ExpertRating Online Microsoft Access Course (2007) leading to Microsoft Access 2007 Skills certification at a special offer price of only $129.99 which includes the in-depth ExpertRating Online Microsoft Access Course (2007)ware and exam fee. This is the best value for money Microsoft Access 2007 Program available till date. You get the following services within the USD $129.99 fee. In-depth ExpertRating Online Microsoft Access Course (2007)ware including scenarios and examples. World wide airmail delivery of the hard copy Microsoft Access 2007 Certificate. The Microsoft Access 2007 certificate can be used to prove your certified status and does not mention the words "online". The process of getting yourself certified is very simple. All you have to do is buy the ExpertRating Online Microsoft Access Course (2007) for $129.99. Log in to the instructor led course using your password. Go through the ExpertRating Online Microsoft Access Course (2007)ware (which would take you 6 weeks) and complete the final Microsoft Access 2007 certification exam at your convenience. You can complete the exam within 2 months of buying the Microsoft Access 2007 certification. The result of the exam appears as soon as it is completed, and your Microsoft Access 2007 certificate is mailed immediately. Chapter assignments to help you practically use the Microsoft Access 2007 skills that you will learn during the Microsoft Access 2007 Course. The final exam is fully based upon the ExpertRating Online Microsoft Access Course (2007)ware that is provided along with the Microsoft Access 2007 certification. If you have gone through the courseware properly you should not have a problem clearing the exam. The exam consists of multiple choice questions from all chapters of the ExpertRating Online Microsoft Access Course (2007)ware. Microsoft Office Access 2007 helps you track and report information quickly and provides you with inbuilt solutions. Microsoft Access is meant for people who want to learn how to work with data in existing databases. This course is the most beneficial for people working in offices, clubs and schools. Microsoft Access helps to create reports, forms and views and groupings. You can also calculate and summarize data and import and export data in various formats for various purposes using this application. Microsoft Access is used by small businesses, big organizations and by programmers to handle and maneuver the data. Taking the ExpertRating Microsoft Access, Intermediate, 2003 Certification is an excellent way for you to prove your professional prowess to employers while giving a boost to your resume. A Microsoft Access database is made up of seven interrelated components: tables, fields, records, forms, queries, reports, and macros. In this lesson, you'll become familiar with each of these components and--perhaps more importantly--you'll learn how each component can help you successfully collect and manage a wide variety of business, personal, or scientific data. And you'll get hands-on experience building tables; creating fields; and manipulating records. Learn how to take advantage of a variety of powerful customization options that will help you simplify the process of adding data to an Access table. You'll get hands-on experience with validation rules, default values, and input masks—time-saving tools that will improve your productivity while increasing the accuracy and reliability of the data you collect. This lesson will literally slash the amount of time you spend performing data entry tasks. You'll deftly sidestep an issue that often plagues Access novices: how to avoid typing and re-typing the same pieces of information over and over again in each of the many tables that make up your database. Discover the powerful and time-saving secret of table relationships. This lesson will give your database a professional makeover. Your database will achieve new levels of attractiveness and sophistication with the introduction of powerful forms. You'll find that forms make it faster, easier, and more pleasant for you to review, add, edit, or remove the information in your tables. Embellish your forms with powerful custom controls like buttons and combo boxes. These custom controls can help you automate tasks you might otherwise find difficult or time-consuming to carry out manually. As a result, you'll work at greater efficiencies and with fewer opportunities for error. One reason why a database is created is to have a place to store information that is collected. Data is stored in a database because it is needed to review that information again. By squirreling the data away today, a future opportunity is generated to review, search, analyze, sort, and subtotal that information as needed. Discover how to use an Access query to scan a vast collection of data and retrieve only the exact pieces of information that you require. In this lesson, you'll overcome all those thorny query issues that often stump both beginning and advanced Access users. You'll learn how to scan the entirety of your database for a single word (or even a tiny word fragment) with pinpoint precision. You'll find out how to seek out a range of dates or numbers instead of placing all your bets on a futile and time-consuming search for a single value. And if you ever find yourself with a better understanding of what you don't want to see than what you do, you'll understand how to perform a reverse query. In a well-designed database, information will be evenly distributed across multiple tables. The advantages of this distributed approach are too numerous to elucidate here, but the approach does raise one important question: is there any way to take all of the information that has been scattered across several tables and bring it together in one place? Fortunately, there is a simple solution. You'll receive ample opportunities to try your hand at combining information from an assortment of tables into a single pool of data. If you really want to show off the data in your database, you'll want to showcase it with a report. A report will help you organize and format your data, making it more accessible and more attractive. There really is only one surefire way to understand what a report is and what it can do for you: you'll just have to create one. And that's exactly what you're going to do in this lesson. In the last lesson, you learned how to convert a table filled with raw information into a handsome, well-organized report suitable for printing. But what if you want to create a report that only shows some, instead of all, of the information contained within a table? Is that even possible? You'll find out in this lesson. 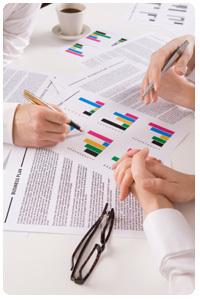 Access comes with a number of pre-formatted reports designed to meet just about any conceivable need. But there will be rare occasions when you want to produce a report that is a little, well, different. A report that goes beyond the norm. A report that communicates with its reader in a new and unique way. In this lesson, you'll learn how you can use the Report Design tool to whip up your very own custom reports from scratch. In the final lesson, you'll learn all about Access macros. An Access macro can automate just about any database activity you can imagine, from running queries to printing reports to opening and closing forms or tables. However, a macro can perform these activities at a much higher rate of speed and with far more accuracy than you could ever manage to muster. This is one of the most popular and eye-opening lessons in the course, covering a fascinating topic you won't want to miss.